Running your own business can be tricky and you may find that your time becomes stretched, so it's important to streamline the businesses processes for it to continue operating effectively and at a profit. Part of ensuring things are running smoothly comes down to the people who perform the tasks - employees on a production line, office staff producing and issuing documents, managers overseeing projects. As humans, we generally operate with goals in mind, even at a young age - "I want to be a firefighter" "I want to be a police officer" - amongst others. But when some people start running a business, they tend to forget about their own goals and suddenly start concentrating on the business alone, worrying about profit, balance sheets and other aspects. It's important to try and keep a goal in mind for your day to day life, as well as your business life. But if you are running your own business, you need to consider the personal development of your employees too. Personal development can come in a number of different forms, including; training, experience, studying and others. Don't think of it as a cost to your business. There's an honest quote that you may have already seen, but it illustrates a common dilemma in a business environment. You may see training and development as a cost, but it can also prove to have a massive benefit for your business, such as better efficiency, better communication, better or new techniques. 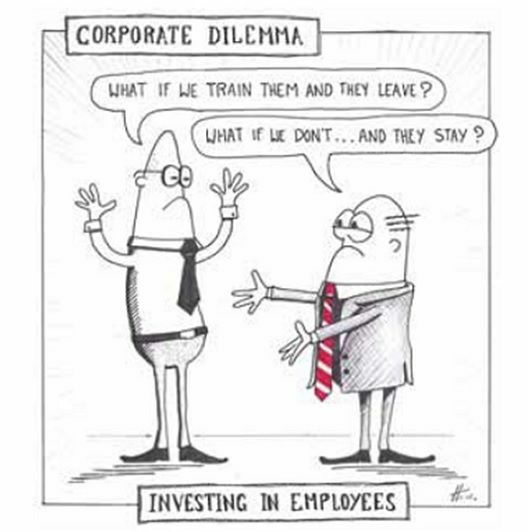 You could very well spend money training a member of staff for them to leave, but if you have the right balance (good training and good benefits), then there's no reason for them to leave. However, if you don't train them, they could still leave for a company who offers a better training plan. Part of the personal development process is having a plan (known as a Personal Development Plan or PDP). This outlines what you would like to achieve and how you can achieve it, including timescales and available resources. You could include this as part of the performance reviews to aid colleagues in their development, and to make sure they fit in with the company's goals. There are several different types of development that could be included. Think about personal development (even transferable skills), and work-related development. For example, one of your goals could be: become a more confident presenter. You could achieve this by taking up opportunities to present, or lead the conversation at networking events. If it's an employee's development, show that you care about their thoughts. Don't force the plan down a work only route, and include external goals too, such as learning new skills. This could return two types of benefits for your business. If it's a skill such as word processing, this could in turn be used in your business. But, it would also show your employee that you care about their skillset and their goals outside of work too. How should goals be defined? Goals should be SMART - Specific, Measureable, Achievable, Realistic and Time-Bound. Set a goal with a specific aim, and ensure the results are measurable and achievable. Is it possible to learn a new skill such as graphic design? This could be achieved by attending a college course, and measured by the qualification given at the end. They also have to be realistic and time-bound. Is learning graphic design realistic? It can be. Is running 20 marathons back to back without training realistic? No (unless you're Superman). Set a time limit for these goals too - give yourself something to work towards in a realistic timeframe. Could you learn the basics of graphic design in 2 days? Probably not. But giving yourself a year would be far more realistic. This will help you push yourself a bit further than you normally would. We started by saying about business owners. It's important for all business owners to consider their own skillset and their personal goals too. Whether it's leadership or management skills, or something more personal to you, keeping your mind active with learning can help keep new ideas flowing as well as the new skills you'll be bringing to the business. For yourself, your colleagues, and your employees, keep on top of your personal development and keep learning new skills to keep pushing yourself forward. With new skills comes new knowledge and potentially better and exciting opportunities.